....that is what Walden, NY was called a century ago, and at its peak supplied nearly half the knives sold in this country. Extend the scope just 20 miles to the northwest & one can include another pocket of knife legacies. Together they form a history that goes back as far as 1856 to the near present of 2015. This thread does overlaps many already existing threads since most cover a single brand, but there are way too many in this richly concentrated knife manufacturing locale to keep track of posting so many different threads & forums. Come one.... come all and join me in this endeavor to gather the greatest collection of photos & history on America's "Little Sheffield"
I guess I'll start it off and it would be only logically to start off with the first manufacturer to arrive in Walden in 1856.... New York Knife Co.
A classic looking bare end 3½" jack with bone handles, steel liners, no shield, a crimped bolster at the blade end.... despite the rough looking edge on those blades, they are still impressively sharp! I've been striving to obtain a 19th century knife.... don't know if this baby gets me over that threshold or not? Its 3¼" closed with 3610 stamped on the back of the main clip blade & green "pearl" celluloid handle. Despite the risks of celluloid, it does make for really attractive handles! Despite how it looks now, by the pitting on the blades & backsprings, one can tell it was once very neglected before someone took the trouble of restoring it by polishing the heck out of it, but I am truly grateful to whoever did it. They managed to save a fine artifact of history! I first thought it to be a serpentine stockman pattern, but I just noticed the pen blade is at the other end! Oh... One thing I noticed about the construction of this knife that I have not seen before is the center brass liner tapers to nothing before reaching the main blade allowing the two backsprings to contact each other under the clip blade, thereby making that end narrower than the other. The green celluloid handled knife is a whittler pattern: 3 blades, 2 springs, master blade bears on both springs. In old catalogs, it was sometimes called "junior premium stock knife". I think KJ is also correct that it is a whittler. That's a collector term for the type of construction. NYKCo was not the only company that made some of their stock knives with this construction. Another example is Remington. This pattern of celluloid covers was called "shell". "Greenshell" in this case. I agree that it's really pretty stuff. You can preserve a knife by wiping down the blades with a rag damp with mineral oil until the blades no longer dirty the rag. Buffing the knife removes metal. Buffing is refinishing rather than preserving. Further rust can be prevented by a thin layer of oil and good storage. But decomposing celluloid covers could still cause damage to a preserved or refinished knife. st, thank you for this information about NYK Co stockman-whittler pattern. I did not know any of this. 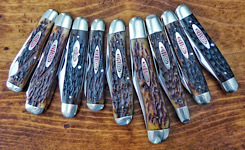 Here is a link to the thread, started by Dimitri, on vintage whittler knives. There have been many discussions on this forum concerning whittlers. After half an hour of searching, I could not find the one I was looking for. One of the comments in it was that "whittler is not a pattern, it is a blade configuration". Apologies to whoever I am quoting here, I can't remember who it was or find the thread. I tend to agree with this this statement, most any pattern can be made with a whittler blade configuration. Very nice knives KAW, and welcome here. And a good thread giving acknowledgement to this huge cutlery producing area. Schrade Walden ... Ulster Knife Co. ... Kingston Cutlery Co. ... Canal Street Cutlery. Those are some wonderful vintage folders KAW and Joe Joe I liked your JOE avatar! Jake thanks for some additional great insights! Dan I agree with your Whittler analysis. Whittler or split back Whittler is a style of construction configuration that can be utilized or adapted to any three blade (one blade on front pivot and two blades on rear pivot) folder pattern. There was an equal end Cattle knife with punch shown here on AAPK recently that was constructed in the split back Whittler fashion. Thank you very much, Lloyd. kj > Thanks for the welcome. Do you know what year the catalog was printed from which your inset is from?.... would be nice to get a gist on when that knife was offered. YES! I got myself a whittler & did even realize it! Check that off the list. Joe > Wow... what a collection of wonderful examples you have there! Underneath that, is one I recognize very well.... as it looks just like my EDC K−horn. One of my favorite knives. Next up…. in 1903, Tom Brady Jr., owner of New York Knife Co. sells out to the Fuller Brothers, owners of the Electric Cutlery Co. of Newark, N.J. (est.1889). Knives stamped “Electric Cutlery Co. / Walden” become an additional product line made along side the Hammer Brand. The Newark, NJ factory is shutdown in 1910 and the Fuller Bros. continued running NYKC until it went bankrupt and shutdown for good in 1931. This slimline knife is of a more unusual style (don’t know the name of it if there is one) with candy stripped celluloid covers. Does anyone have more info about this kind of knife? Hi Lloyd. Good to see you here! That NYKCo catalog cut was from 1925. I also have examples from '24 and '27. Those are all exact matches. I have earlier examples of the knife with bone covers. 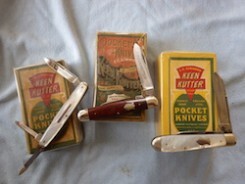 They also made the junior size with different blades as well as different covers. And they also made larger stock knives with the same construction. I had one with the greenshell covers that was 3 7/8" closed and had a punch in place of the pen blade. Great knives KAW, very interesting celluloid on the Electric! Beautiful batch of old knives, Joe! I apologize for my earlier, too far, digression.